The initial confrontation began Wednesday after Greenpeace activists, located in the northern Pechora Sea, scaled a Russian oil rig operated by a Gazprom subsidiary to protest its plans for drilling in Arctic waters. A standoff between environmentalists and Russian authorities in the Arctic got a few degrees hotter Thursday, with Kalashnikov-toting men reportedly seizing a Greenpeace ship sailing under the Dutch flag, hours after Moscow announced it had handed the Dutch ambassador a diplomatic note expressing concern over the activists’ protest a day earlier. The armed men, believed to be Russian border guards, boarded the Arctic Sunrise icebreaker in international waters, Greenpeace said in a statement, adding that all 25 crew members had been forced into the mess hall at gunpoint and locked there. No official comment from the border guards was available as of this article’s publication, despite calls to their local press service in the Murmansk Region and to the Federal Security Service, which oversees the Russian border guards, as well as to a border guard motorboat reportedly patrolling near the Arctic Sunrise. The initial confrontation began Wednesday after Greenpeace activists, located in the northern Pechora Sea, scaled a Russian oil rig operated by Gazprom subsidiary Gazprom Neft Shelf to protest its plans for drilling in Arctic waters. Russian border guards fired warning shots at the environmentalists’ ship and detained two activists. According to photos distributed by Greenpeace, the two, a Finnish and Swiss national, were detained at gun- and knifepoint. “The violators’ actions were of an aggressive and provocative nature and had the appearance of extremist activity capable of causing human deaths and other grave consequences,” the ministry said in a statement on its website, noting that the ambassador had been summoned and presented with the note Wednesday. “The last time a Greenpeace ship was seized was in 1985,” the environmental group said on its Twitter feed, referring to the notorious sinking of its Rainbow Warrior in a covert operation by French secret services off the coast of New Zealand that year. Before Greenpeace reported that the Arctic Sunrise crew had been locked in the mess hall, the people aboard the ship had been posting to its Twitter account. The last message there, a few hours before the Greenpeace statement, claimed that most of the crew was kneeling at gunpoint on the main deck as armed men searched the ship and tried to break down the barricaded door of the press room. Earlier the crew tweeted that the armed men had descended from a helicopter. 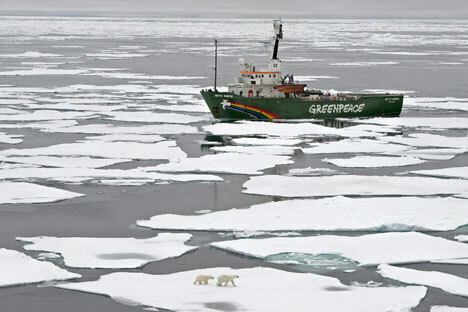 Photos published by Greenpeace also showed masked men in a rubber motorboat near the ship, one waving a grappling hook. Greenpeace argued that Russian border guards had no right to be onboard the Arctic Sunrise as it was operating in international waters. “There was no reason to seize the ship,” Sergei Tsyplenkov, executive director of Greenpeace Russia, said on the group’s website. Greenpeace Russia also alleged on Twitter that the seizure could amount to an act of maritime piracy; ironically, it took place on International Talk Like a Pirate Day. The two detained activists were returned to the Arctic Sunrise during Thursday’s standoff. Greenpeace had previously said they were being “held against their will” and denied communication with the ship. But earlier Thursday a spokesman for the Federal Security Service blamed Greenpeace for not taking the activists back. “Greenpeace is not letting the border guard squad on their ship and cannot be contacted, which is why the detainees are still aboard a border guard motorboat. They have no complaints, and the border guards have no complaints against them,” the spokesman said, without elaborating. Greenpeace also said Thursday it was launching a permanent picket by Gazprom’s Moscow office and plans to picket Russian embassies worldwide on Friday. Neither Gazprom nor Gazprom Neft Shelf had commented on the standoff with the activists as of Thursday evening. The Arctic Sunrise, which arrived in the Russian Arctic in August, had already faced trouble with Russian authorities, who banned it then from the Moscow-controlled Northern Sea Route. Greenpeace and other environmental groups oppose drilling for oil in the Arctic on claims that modern technologies are insufficient for cleaning up possible oil spills threatening the region’s fragile ecosystem, and that drilling in the region cannot be economically viable without state subsidies.